Copper is one of the oldest metals used to make jewelry. Its use dates back to 8,000 to 3,000 BCE. While times and styles have certainly changed, the appeal of copper has not. Today, copper is still used to make eye-catching necklaces, earrings, rings, and bracelets. Novices and experienced jewelry makers alike enjoy working with copper, as it is one of the most affordable metals. 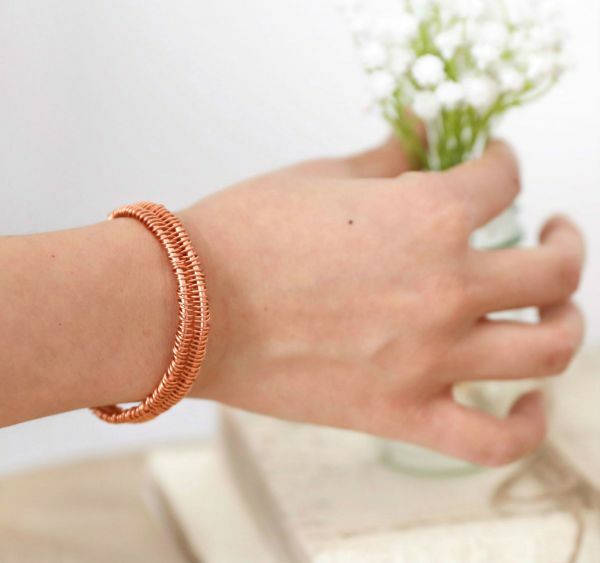 For example, it's possible to create a lovely woven copper cuff bracelet on a shoestring budget. The layperson who wishes to create custom designed jewelry without hurting her wallet, can start right now. 1. Cut two pieces of 18 gauge cooper wire, measuring approximately six inches each, with wire cutters. 2. 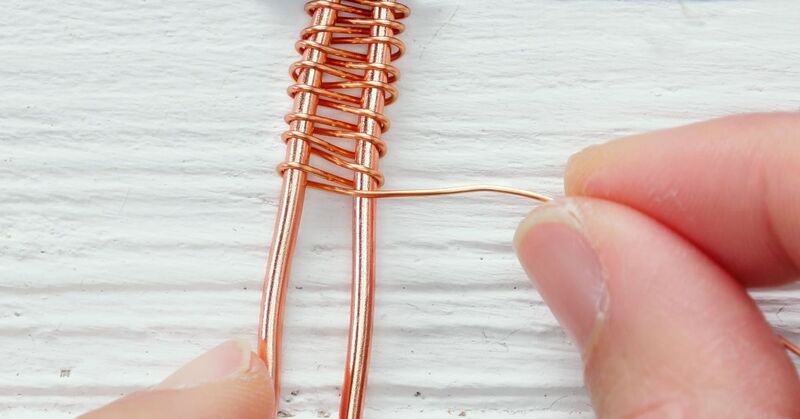 Lay the two pieces of 18 gauge copper wire vertically on a flat surface. Imagine the pieces will serve as the sides of a ladder, and the next step will introduce the rungs of this ladder. This "ladder" is actually the cuff bracelet. 3. Unravel approximately two feet of 22 gauge copper wire from the roll. 4. Twist the 22 gauge copper around the top of a piece of 18 gauge copper wire. Make approximately three twists to secure the thinner wire to the thicker wire. 5. Rip a piece of masking tape from the roll. 6. Tape the two pieces of 18 gauge copper wire to a flat surface. Keep the 18 gauge strips of wire in a vertical position, approximately 1/4 inch away from each other. 7. Grab the piece of 22 gauge copper wire from Step 4, which should be fastened to left side of the bracelet. Pull it to the right. 8. Pull the thinner, 22 gauge wire, over and under the 18 gauge wire. 9. Drag the 22 gauge wire back to the left, pulling it over and under the left side of the bracelet. 10. Continue the over and under motion, keeping the wire taut, until reaching 1/2 inch from the bottom of the bracelet. 11. Wrap the 22 gauge wire around the right side of the 18 gauge copper. Cut any excess 22 gauge wire with wire cutters. 12. Untape the bracelet from the flat surface. Discard tape. 13. Lay the bracelet in a horizontal position. 14. Work from the right side of the bracelet. Twist the 18 gauge ends up and over with pliers, making two small hoops. Ensure the bottom of each hoop is flush against metal to prevent scratching the wrist. 15. Repeat the actions from the previous step on the left side of the bracelet. 16. Bend the bracelet in a "C" to give it a cuff shape. 17. Place the bracelet on the wrist; tighten the bracelet if necessary by bending the copper around the wrist.